Stuttgart – It was an exciting and fitting conclusion to the 34th International STUTTGART GERMAN MASTERS Horse Show: in front of 6,500 enthusiastic spectators in the Hanns-Martin-Schleyer-Halle, Pieter Devos became the first Belgian to win the Grand Prix of Stuttgart with MERCEDES-BENZ, WALTER solar and BW-BANK when riding the Dutch gelding Apart to victory in the jump-off. 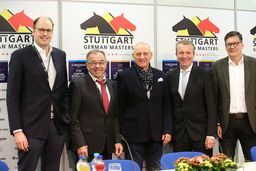 Stuttgart – The 34th STUTTGART GERMAN MASTERS will today, Sunday, draw to a close with the Longines FEI World CupTM Jumping for the Grand Prix of Stuttgart with MERCEDES-BENZ, WALTER solar and BW-Bank. 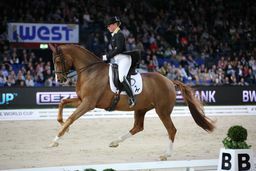 Stuttgart – It’s her sixth GERMAN DRESSAGE MASTER win in succession and her 15th in total. 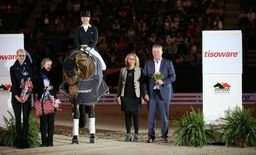 German Isabell Werth was an easy winner of the Grand Prix Special in the Hanns-Martin-Schleyer-Halle on Sunday. 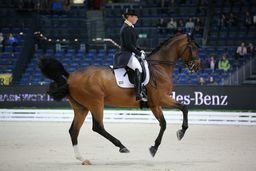 Stuttgart – Germany’s Isabell Werth today chalked up her ninth win in the Grand Prix freestyle – and for the third time in succession as a qualifying class for the FEI Dressage World CupTM. 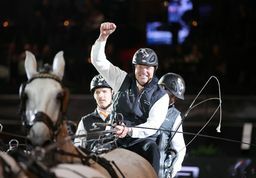 Stuttgart – For the third time after 2007 and 2016, the Dutchman Ijsbrand Chardon today won the DB SCHENKER GERMAN MASTER title at the 34th International STUTTGART GERMAN MASTERS Horse Show in the Hanns-Martin-Schleyer-Halle. 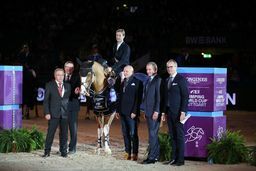 Stuttgart – “Isabell’s Stuttgart wins” – Take two: second class and second win for the world’s all-time most successful rider.